On the occasion of the Kargil Vijay Day, I re-post my interview with Param Vir Chakra, Jogender Singh Yadav entitled, Independence Day Special: The Hero of Tiger Hill is posted on Rediff.com. Yogender Singh Yadav survived 15 bullets while capturing Tiger Hill in the Kargil War and was awarded the Param Vir Chakra, India's highest award for gallantry. On the eve of Independence Day, the 32-year-old soldier relives that night when he and his fellow commandos won one of India's most historic military victories. 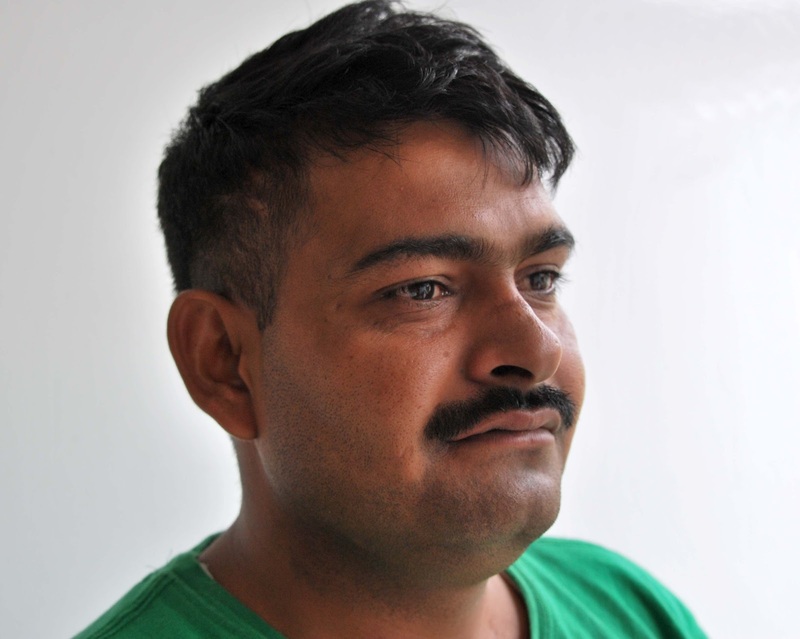 Yogender Singh Yadav of the 18 Grenadiers believes that every deadly bullet has a name engraved on it. Yadav knows what he speaks about; after all he survived some 15 bullets while capturing Tiger Hill during the Kargil conflict and was awarded the highest award for gallantry: The Param Vir Chakra. Yadav was a member of the 'ghatak' (assault) commando platoon which captured three strategic bunkers on Tiger Hill overlooking the Drass-Kargil road on the night of July 3-4, 1999. 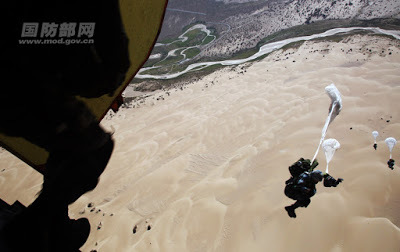 Twenty-two highly-trained men approached the Pakistan-occupied peak via a vertical cliff at an altitude of 16,500 feet. Claude Arpi met the hero recently. 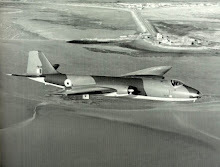 Interestingly, the long list of prepared questions was soon set aside as the commando, now 32 years old, started to 're-live' his experience. It is only towards the end of the encounter that Claude could ask him a few clarifications. Claude Arpi (CA): Some thirteen years ago, on July 3, you and your team was given the task of capturing Tiger Hill. What do you remember of these difficult days? What were your feelings then? How do you recall the events today? Yogender Singh Yadav (YSY): Even though 13 years have passed, I still feel that the Kargil war happened just yesterday. I will never be able to forget through my whole life the memories of Kargil. During this war, I do not know how many comrades I lost; comrades who were even dearer than my own brothers. Inside me live their memories and it will thus continue to be. 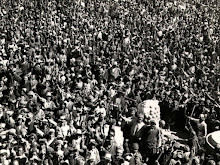 I do not know how many hundreds of my comrades were injured; today some among them cannot even walk or move. Those are 13 years of memories... it is still as if it all just happened to me yesterday. I remember, 13 years ago, on the night of July 3-4, my battalion was ordered to capture Tiger Hill top. Tiger Hill was the highest peak in the Drass sector. To take control of it was very difficult; a height of 16,500 feet, with sheer, precipitous sides of ice and snow. Before that we had won mastery over many hills (particularly Tololing), but our success could turn into failure, if the dominating feature of Tiger Hill was not won, all other victories could be nullified. The senior commanders concluded that only after Tiger Hill is captured would our other gains bring a complete success. Our battalion was then ordered to capture the top of Tiger Hill; attack plans were made. A 'ghatak' (assault) platoon was formed, with Lieutenant Balwan Singh as commander. This 'ghatak' platoon, under the battalion, was to attack the top of Tiger Hill first. The path that we decided to take was such that the Pakistani forces could not envisage that the Indian Army would be using this path to reach the top. The path to the Pakistani positions had sheer, vertical peaks. We made plans on how to accomplish our task and finally on July 2, we set out to accomplish our goal. The whole battalion moved together. The attack could only happen at night as the enemy, from their heights, could observe us from afar. 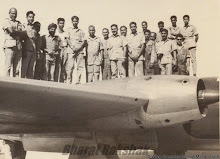 If we had attacked during the day, they would have shot down our jawans; hence we could only attack in the dead of night, that too, when the moon was hidden. After an arduous climb for two days, during the night of July 3-4, we went through a tremendously difficult path, a very small path. But hearing the stones sliding under our feet, the enemy surmised that the Indian Army has reached this area. They opened fire on us. When the firing started, there were only seven jawans who were ahead; the others were slowly reaching up from below in a line. A bit of path was blocked and only those seven jawans had been able to reach this higher spot. We reached up to a 8 to 10 feet level with Pakistani bunkers; 4 to 5 soldiers opened fire at us. All seven of us went on firing and sent several Pakistani soldiers into the valley of death. We obtained victory on that ledge. But the top of Tiger Hill was still 30 to 35 metres higher. From there the enemy could see where the Indian soldiers had reached. They started firing at us so heavily that neither were we able to move higher, nor could we could come out from behind the rocks. For five hours, the exchange of fire continued, however they were unable to estimate how many jawans were present below them. At about 10.30 am, the Pakistanis sent some 10, 12 soldiers to check. When the enemy came close to us, we fired at them and killed them all, excepting one or two. But by then our positions had been marked by the Pakistanis and they knew how many we were; they returned to the top to report to their commanders that there were only 8, 10 Indian soldiers below. Within 30 minutes of getting this information, the Pakistani troops launched a counter attack on us; such a powerful attack, using several supporting weapons, throwing big boulders down on us. As they slowly came closer and closer, they managed to damage our LMG (Light Machine Gun), our supporting weapon. Then they got still closer and launched a hand to hand battle, during which six of my companions were martyred. I still remember that moment, those preceding instants when we seven mates were discussing and talking together about what to do next and what was going to happen, and the instant later when all my comrades had been martyred. I was bereft by this loss, but also glad that before losing their lives they had killed 10, 12 enemy soldiers. I too was severely wounded and was taken for dead by the enemy. Two, three times, they returned to shoot some bullets into all the dead bodies and checked that no one was alive. The enemy also shot bullets into my body, I was shot in the arm and leg, but had firmly resolved that unless I got a bullet in my heart or head, I would remain alive, even if they cut off my arms and legs. It is due to that resolve and will that I am alive today. Some 500 metres below was our MMG (Medium Machine Gun) post, the enemy then made plans to destroy it. Next to Tiger Hill was the Mushkoh valley, where their base camp was located. It is from there that the orders to destroy the MMG post came. I heard this order; I knew that some 10, 12 of my fellow soldiers were manning the MMG post. In my heart, a voice spoke to me and said that I must save my companions. It is true that if one remembers Ishwar (the Lord) with full faith, then Ishwar-shakti (the Lord's power) aids you. It can even appear before you.I prayed to Ishwar to keep me alive long enough to save my comrades. Perhaps He heard my prayer. When the Pakistani soldiers again shot at us and tried to take our weapons, I attacked them with a grenade. One of their soldiers was killed. Another turned his muzzle at me and fired at my chest. In my breast pocket was my purse which contained some five rupee coins. The bullet hit the coins and ricocheted away; I felt that I had died. But the next instant, when he bent to take my weapon, my eyes opened and I realised that I was still alive. Within a moment, I turned and grabbing a rifle, opened fire on them. 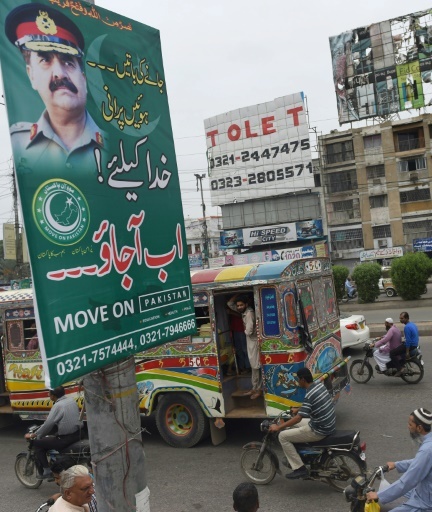 During the firing, four Pakistani soldiers were killed. I fired from one boulder, then rolled behind another to fire again and then a third. They thought that some Indian reinforcements had reached from below and they ran away. I returned to my companions to check if any of them were alive, but to my deep sorrow, no one was. I tried to see how to descend, when Devi-shakti appeared before me and told me how to go down. My broken arm was useless at my side, I tried to tie it, I even tried to break it off with a jerk, but I could not manage. Finally, I fixed it into my belt behind my back and rolled downhill towards my companions. I gave my mates the warning about the impending attack and told my team commander, Lieutenant Balwan Sahib the entire story. He, in turn reported to our battalion commander that our leading section had been entirely destroyed, only one jawan had returned (Yogender Singh Yadav) and he is giving this information. Battalion Commanding Officer Colonel Khushal Chand Thakur told them to get this jawan down to him as quickly as possible so that he could hear the information first hand. At that time it must have been 1:30, 2 in the afternoon (of July 4). Blood was flowing from my wounds like water. Though my comrades gave me first aid, the bleeding would not stop. They brought me back to the CO and by the time we reached, it was completely dark, and I was unable to see. The CO asked, "Son, do you recognise me?" but I could see nothing. He had me laid in his personal tent, and had 2, 3 stoves lit around me. When my body gradually got warmer, the RMO (Regiment Medical Officer) Sahib came and gave me again some first aid and made me drink some glucose. I got some sort of energy back in my body and then the CO asked again, "Tell me now, son, what happened with you all?" I told him the whole story and concluded that "Now Sir, they are going to attack the MMG post. Sir, you see, beyond this helipad there are stones, behind which are the living tents of the enemy, they have support weapons deployed there, and ammunition has been dumped there." After I gave this information, RMO Sahib gave me an injection to put me to sleep. When I woke up three days later, I was at the Srinagar base hospital. I learned that the same night, our reserve company had attacked the top of Tiger Hill, and without any casualties, had succeeded in capturing the top. I was then shifted to the army hospital, New Delhi, and after 16 months of treatment, I could serve the army again. It is the dream of every soldier to fight for his country and with his own blood to anoint this motherland. To be able to do this is his great fortune. I consider myself fortunate to have taken birth on Mother India's soil and to be part of this great Indian Army, which is today considered to be one of the best in the world. I am proud of my country and of our army and I would tell the youth of this country that we can be devoted to our nation from anywhere, but the real progress, the inner and outer protection only comes when we all come together, when we try to progress in every realm and each one tries to grow in our own sphere. I would appeal to our youth that no matter which area you chose, you should work with honesty, straightforwardness and work hard and you should keep their devotion to their country awake, alive. Jai Hind! You said that the Devi Ma's Shakti came to you. You had earlier already had a vision, telling you that you would be injured, but would not die. Please can you elaborate? When, with full faith, a man surrenders everything he has to accomplish a certain task, and this, without reserve, (ulterior) motive or calculation, certainly then, an inner strength, a shakti, arises in him. He becomes conscious of what is going to happen to him today or tomorrow or whenever. This happened to me, I was given the awareness that I would be injured; my arms and legs would become useless, but that I would remain alive. It is a fact that in Kargil we had surrendered ourselves fully to our task (to recover Tiger Hill from the Pakistanis), we were fully aware that we could lose our lives, but we still surrendered ourselves to the task ahead with complete faith in the Lord... then there is no question of thinking that one could fail in one's work. The task has to be completed -- the Lord himself tests man, He tests how much a person can take, how much pain he can bear; only when one can bear the most intolerable pain does the divine strength comes (to accomplish the task). CA: You had the certitude that you would not die, tell us more about this vision of 'Devi Ma' who showed you the way down to the MMG post? YSY: At that time, I knew that I had to reach my comrades; it was a selfless wish, to try to save the lives of my mates, my brothers. I had no desire to try to save my own life, in fact having witnessed my six companions sacrifice their lives, I was proud that I was now being given another opportunity to serve my motherland and follow in their footsteps. This is the dream of every soldier, his glorious journey to fulfil the prime duty of his life. When he returns home wrapped in the national Tricolour, his family, his country and even the whole world rejoices with tears at his self-sacrifice. I was given that strength and She showed me the way down. CA: The 'vision' told you which way you must take? YSY: Yes, absolutely, in front was a being in white who said, "Son, roll down this nalla (gully)." CA: Have you seen LOC Kargil, the Hindi movie made about your action? They did not interview me for that. But the movie, LOC Kargil has my role played by Manoj Bajpai. Did you see the movie? How did you find it? YSY: I liked it. They have highlighted the task that I and my companions performed; our sacrifice for the good. The world could see this. It made the general public aware of the difficulties a soldier has to endure to do his duty successfully. I liked it very much. CA: Thirteen years later, would you do it again? YSY: Yes. Many citizens wants to join the army, (not all are selected), but those who are, feel they are blessed that out of so many aspirants they are the chosen few who will serve to protect their country. A soldier's ultimate wish is that he should be allowed to do this job of protecting his country, and even if he has to lay down his life to do it, that is not too big a sacrifice. I have merely shed some of my blood for my motherland, only put a tilak with my blood on her land, but I am still alive. But if I were given the chance, I would put down this life for her. CA: Since that time, there have been a lot of changes in the army? YSY: The Army is the Army. At that time, there were many shortages in the army, lack of equipment, ammunitions, adequate clothing, etc. Has the situation improved? At that time (in 1999), the war was declared all of a sudden. In those areas (Kargil-Drass sectors), there was little army deployment. The units which had to be called in from other parts of India, from the plains and they did not have the right clothing. But the main need of the hour (during the war(, was neither adequate clothing nor right equipment available, but to accomplish the task at hand, and this, with whatever means we had. It is a matter of pride that the Indian Army jawan has a dedication, a patriotism not present in any other army of the world. It is only because of this that we were able to vanquish the enemy at those impenetrable mountain heights. CA: It is said that a soldier believes that every bullet carries someone's name on it. Do you believe that too? YSY: Of course. See, I am a soldier, and so is the man fighting against me, we are not bothered by which bullet carries whose name. Definitely each bullet carries a name, just as we say that every morsel of food bears the name of the person who must eat it. Similarly, for a soldier, he has a bullet with his name on it, the one which will kill him; perhaps the bullet with my name was not made and as a result, I am still alive. Though not mentioned in this interview, one of the motivations of the jawans and officers during the Kargil conflict was the barbarian behaviour of the Pakistanis. On May 15, 1999, India sent a patrol to ascertain if some parts of her territory were occupied by intruders. The patrol was ambushed on the Indian side of the LoC and the patrol leader, Lieutenant Saurabh Kalia and five of his jawans were captured and tortured. Their mutilated bodies were returned on June 9. Yogender and his companions knew this. It motivated them further to recapture Tiger Hill. Before the attack on Tiger Hill, Yogender Singh Yadav's battalion had been involved in the battle for Tololing, another peak occupied by Pakistan. They fought for 22 days. Many Indian jawans and officers lost their lives in the battle. Yogender who was just married and could only reach his battalion a few days after the battle had started was given the task of supplying ammunition to the forward troops. The 19-year-old Grenadier managed to climb the peak twice a day to supply his companions. In a booklet on his life, he stated: 'It was gruelling and back-breaking work. My officers noted that I had tremendous stamina and could climb these treacherous steep and snow-covered slippery slopes almost constantly for 2 days carrying heavy loads. Please see: Our Heroes: Param Vir Chakra, Grenadier Yogender Singh Yadav, Shyam Kumari, Vraja Trust, Pondicherry, 2011. It is why he was selected to lead the final assault on Tiger Hill. Claude Arpi gratefully acknowledges the help of Mrs Shyam Kumari, Lieutenant Colonel Uma Tewari (AMC, Retd) and Abha. The interview was conducted in Hindi. The Chinese are not happy! Last week, they were furious after the announcement of the verdict of the Permanent Court of Arbitration (PCA). The International Tribunal in The Hague had given its ruling on a reference by the Philippines over the South China Sea (SCS): China has no historic ‘rights’ over the natural resources in most of the areas of the SCS; further any right must not exceed what’s permitted by the UN Convention on the Law of the Sea (UNCLOS). Now, China is upset again. This time, it is because the Indian press reported the deployment of T-72 battle tanks in Ladakh. 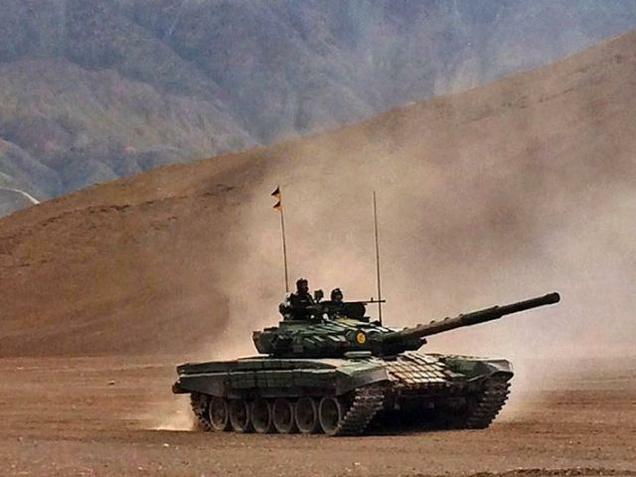 Since the past 36 months, ground forces and artillery guns have been backed by T-72 Russian-origin tanks and another tank unit is slated to move to Eastern Ladakh facing China: “This adds a new dimension to any future war in the area that is marked by an average height of 14,000 feet, where oxygen is scarce,” says The Tribune. How can protecting the Indian borders ‘hinder’ Chinese investments? Are the Chinese doing India a favour by investing? What have the tanks to do with the investment policy? You may call this ‘logic with Chinese characteristics’, especially at a time China is behaving badly and illegally the South China Sea. In other words, it tells Delhi, ‘forget about your borders, make business easier for us’. 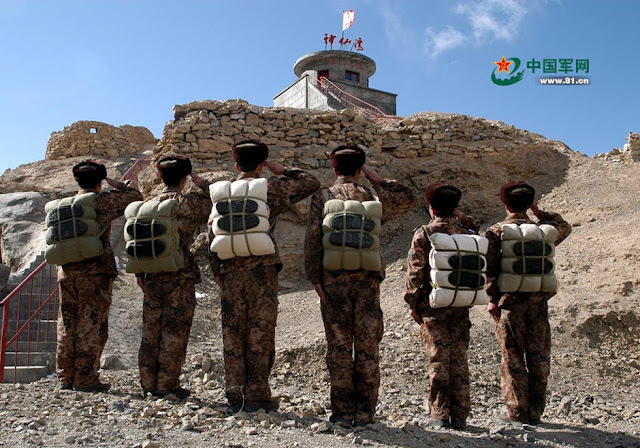 What is amazing is that China has developed its dual-use infrastructure on the Tibetan plateau at a very rapid pace during the last few decades, but now it objects to India occupying its own territory and taking necessary measures to defend its borders. 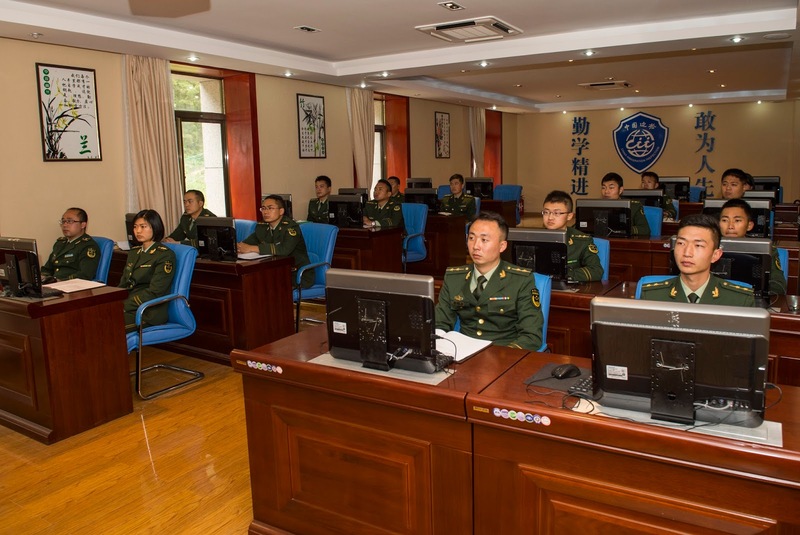 Further, China recently raised the level of the Tibet Military Command's (TMC) authority. 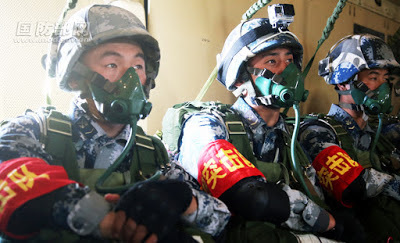 China Military Online admitted: “China continues to strengthen its military presence in the autonomous region and aims to allow the military command to shoulder more combat assignments. …The TMC's political rank will be elevated to one level higher than its counterpart provincial-level military commands, and will come under the leadership of the PLA Army.” It added that the promotion marks a "new journey for the Tibet military command's construction." So why make so much fuss for a few Indian tanks at a time when China moved its 15th Airborne Corps to Tibet? 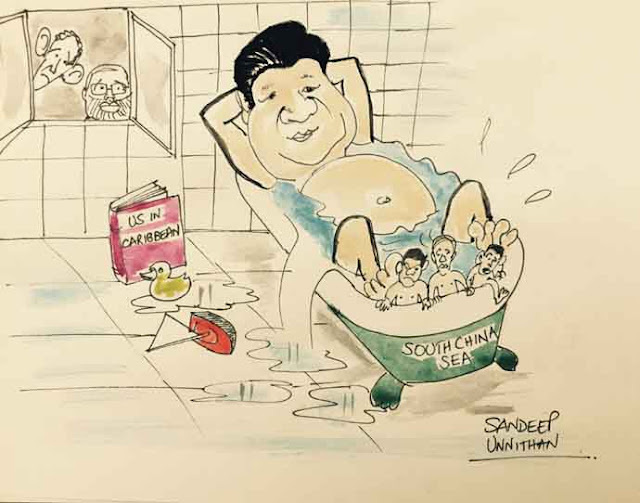 According to the same principle, Delhi should stop doing business with China because Beijing has illegally (according to the La Hague Tribunal) occupied most of the South China Sea, where it has built mega infrastructures, even on ‘rocks’? This is one more example of Chinese double standards. But Delhi has probably touched a raw nerve. A rejuvenated China is bound to bully its neighbours and economic partners. India has to take all measures to counter the Chinese tactics, investment or no investment. My article For the Sake of Happiness appeared in Hindi in 23 editions of the Dainik Baskar. The translation is not mine! Just Google 'Bhutan', hundreds of articles such as ‘discover a kingdom where happiness rules’ will appear on your screen. The Kingdom of the Dragon is today considered as the happiest and most contented country of the planet. But what is the happiness? Well, a definition can’t replace a smile on a child’s face; happiness is indeed beyond definition. What is more interesting is that a tiny (in size) nation has made the concept of ‘global happiness’ known to the world. It is true that for centuries, Bhutan’s culture has been based on a deeper understanding of life, and not on purely material development whose only objective is a constant increase of the gross domestic product. It was a stroke of genius, from a monarch who perhaps saw the Future. It was not fashionable as yet, when Thimphu first pledged to have an economy preserving Bhutan’s culture of contentment (santosh). Bhutan may not be a world decider like the US, China or India, but the Himalayan nation is now regularly cited during international conference. Bhutan is also present in mundane news, for the right reasons: their Royal Highnesses the Duke and Duchess of Cambridge visited the Land of Happiness and trekked up to the picturesque Tiger's Lair, also known as Paro Taktsang in Dzongka, Bhutan’s national language. The monastery complex, hanging on a cliffside of the upper Paro valley, was built during the 17th century on the spot where the Swat-born Guru Padmasambhava meditated for three years, three months and three days. Paro Taktsang is one the thirteen ‘Taktsang’ caves which were blessed by the Master of Supreme Happiness. Looking at the photos taken by the journalists who followed the couple half-way, the royals must have experienced some bliss during the unusual trek. Does the world understand happiness? A few weeks earlier, data collected by the United Nations from people in 156 countries, had surprisingly ranked Bhutan a lowly 84 in the list of Happy Nations. Different variables were used: real GDP per capita, social support, healthy life expectancy, freedom to make life choices, generosity, and perceptions of corruption. The fact that Denmark, Switzerland, Iceland, Norway and Finland are the five toppers shows that these variables are based on Western values. It is a great pity! Can you believe that China is listed 83, just before Bhutan, while India is 118? Each country is also compared against Dystopia, a hypothetical nation characterized by human misery, oppression, disease, overcrowding and pervasive fear, a place where everything is wrong. Dystopia is the opposite of Utopia, synonymous for an ideal society with no crime or poverty. Despite the Western prejudice (or lack of understanding) in the data collection and analysis, it is interesting to see that the UN has begun studying the concept of ‘happiness’ which has been central to the Indian and Himalayan culture. A few weeks ago, Tshering Tobgay, the Bhutan Prime Minister gave a most inspirational TED talk at Vancouver, Canada. The latter are connected through a network of biological corridors: even animals should be happy in Bhutan. 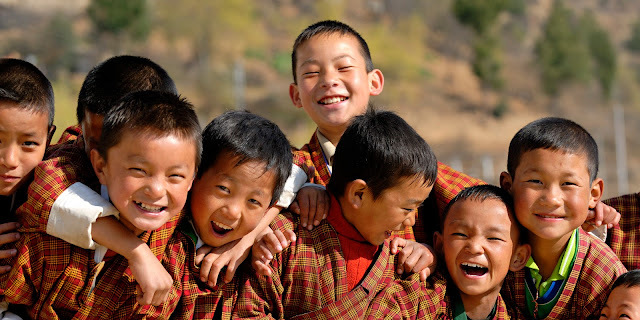 Bhutan defined the four pillars of ‘Happiness’ as sustainable development, preservation and promotion of cultural values, conservation of the natural environment, and establishment of good governance. GNH is officially part of Bhutan's five-year planning process, which guides the economic development of the nation. ‘Happiness is no more a utopia; Bhutan is often now cited as an example to follow. Being a Global Village, in today’s world, no nation remains secluded, able to play according to its own rules without reference to its neighbours. One could ask: with Bhutan becoming wealthier, will Happiness be consigned to the backstage for the sake of greater ‘wealth’? If one believes news reports, dam companies will soon rule the Land of the Dragon. With ‘development’ becoming the universal god, can society remains ‘happy’? It is up to Bhutan, but the important point is that the concept of ‘Happiness’ is now acknowledged worldwide. It is a fact that the fauna is still happy in Bhutan. The Land of the Dragon has the highest population of the White-bellied Heron (ardea insignis) in the world. It was acknowledged during an international workshop on White-bellied Heron conservation conducted by the Royal Society for Protection of Nature. Bhutan now has 47 percent of the WBH global population, up from only 14 earlier. I sometime wonder how Padmasambhava would have fared under the UN criteria. He had no social security, no wifi, no means of transportation (except for levitation), no house (though taktsang have breathtaking views), but his cave is still charged with happiness. Will it last, is another question. is how a Chinese ‘expert’ reacted after the announcement of the verdict of the Permanent Court of Arbitration (PCA) on China Military Online. The International Tribunal in The Hague had just announced its ruling on a reference by the Philippines over the South China Sea (SCS); the Philippines had objected to Beijing violating its sovereign rights in the SCS. Further there was no evidence China had historically controlled the waters or its resources exclusively. The court maintained it had jurisdiction to consider historic rights and maritime entitlements. The ruling is a terrible blow in the face for the land- (and sea-) grabbing Middle Kingdom. It then detailed the different Islands and rocks ‘belonging’ to China and adds: “Since its founding on October 1, 1949, the People' s Republic of China has been firm in upholding China' s territorial sovereignty and maritime rights and interests in the South China Sea.” It quotes internal laws and conventions which mean nothing in International Law. Beijing’s main argument is that the SCS disputes are inseparable from sovereignty issues and as such, the issues were beyond the scope of the UNCLOS, which was referred by the tribunal in its ruling. Well, the argumentation is weak to say the least, even if Chinese citizens have reacted angrily to a ruling. Though written long ago, it is shows that Chinese mindset. As mentioned earlier, the Chinese reaction was violent. Will this help? Certainly not. Though it will be difficult to implement the judgment, it could however create jurisprudence. The Permanent Court of Arbitration (PCA) is not a UN court, but “organiser of arbitral tribunals to resolve conflicts between member states, international organizations, or private parties,” it remains a very respectable and respected institution. The range of legal issues taken by the PCA can involve territorial and maritime boundaries, sovereignty, human rights, international investment, and international and regional trade. The first effect of the ruling of the Court may to calm down the irredentist ardours of the Middle Kingdom, at least for some time. It is a first international warning to China: if Beijing wants to become a ‘normal’ State, it has to follow the rules accepted by the rest of the world community. Beijing has to decide in which category it wants to be listed: with the rogue States like North Korea or with ‘normal’ States? Take the example of Arunachal Pradesh. For years, China has been trying to claim the entire Indian State as hers, with no historical justification, except for the fact that a small part of State (Tawang) has once upon a time paid monastic taxes to a monastery near Lhasa. Chinese claims are clearly not tenable in international law. Arunachal may be the most glaring case, but the above is also true for many areas in Ladakh, in Uttarakhand or Himachal … and in POK as well. Without any historical basis, Beijing has regularly claimed large chunks of its neighbours’s territory. The ruling of the PCA should remind China that all the nations live on the same planet and commonly agreed rules should be followed by all. Though in 1959, the International Commission of Jurists had condemned China’s Human Rights violation in Tibet, it is the first time that the issue of territoriality involving China has been looked into, analyzed and a judgment delivered. This creates a precedent which has other serious implications. The Chinese President may say that “the Permanent Court of Arbitration’s verdict will not affect Beijing’s territorial sovereignty and maritime interests in the fiercely contested waters,” it will definitively create a jurisprudence with the possibility of more States approaching the PCA. During a meeting with European Council President Donald Tusk and European Commission President Jean-Claude Juncker, President Xi Jinping stated that China will not accept any proposition or action based on an international tribunal’s ruling over the disputed SCS: “We firmly insist on maintaining peace and stability in the South China Sea, and on directly negotiating for a peaceful resolution on relevant disputes with states that are directly involved, based on the respect of history and in accordance with international laws,” Xi said. Today, China only accepts the common rules favorable to China. After the La Hague verdict, it may not be acceptable for the world community any more. In April 2015, Xi arrived in Islamabad bringing with him generous gifts for Pakistan: an eye-popping $46 billion worth of planned energy and infrastructure investment to boost Pakistan's flagging economy. This included 10,400 megawatts to Pakistan's national grid through coal, nuclear and renewable energy projects. It sounded like a Chinese Dream for Islamabad! Beijing wanted to help Pakistan to develop a China-Pakistan Economic Corridor (CPEC) which will eventually link up its pet project, the two New Silks Roads (also known as ‘One Belt, One Road’). In other words, the Chinese-sponsored port of Gwadar on the Arabian Sea will be connected through the Karakoram Highway, to the Xinjiang province in China’s Far West and Central Asia …and later Middle East, Africa and Europe. The ‘corridor’ will have railways, roads, optical fiber cables, dams (to produce the necessary electricity), pipelines, you name it! Observers marveled at Beijing kindness (and wealth), but don’t be fooled by the Chinese generosity: Beijing is investing for Beijing! The important point for India is that several of the CPEC’s crosses over the Indian territory in Kashmir. It is not acceptable and ultimately India could, as a last resort, take one day the Philippines way. With a wounded ego, the Middle Kingdom can become even more belligerent; in any case the reference to the PCA shows that if Beijing does not accept the verdict, it will be difficult to be considered as a ‘normal’ State by the world community. In May 2015, the Chinese Government published a White Paper (WP) on Defence, putting forward new objectives for the People’s Liberation Army (PLA). 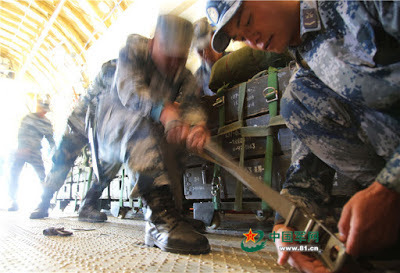 Beijing announced that the PLA’s military strategy was to ‘win informationized local wars’. Mao’s old view of ‘an Army of peasants’ is dead and gone. 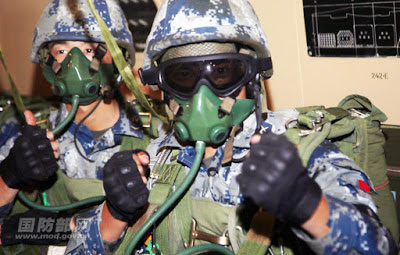 In the years to come, the Chinese Navy and the Air Force are bound to take a more preponderant place in Beijing’s defence strategy, but it does not mean that China is going to forget its land neighbours, first and foremost India. In May 2016, The Global Times announced that the status of the Tibet Military Command (TMC) facing India from Arunachal Pradesh to Ladakh was to be raised. It was part of the in-depth reforms instituted by President Xi Jinping, who is also the Chairman of the all-powerful Central Military Commission (CMC). The fact is that there is only India on the other side of the Himalayan range! For this, Beijing has a clearly-defined plan …and a tool: the railway line. The most important strategic development in the recent decades has been the arrival of the train on the Tibetan plateau in July 2006. For Beijing, it has been a historic event. 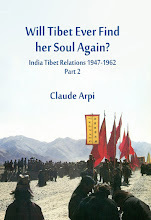 The train has brought radical changes not only for China or the Tibetans, but for India too. An article on the China Tibet Online remarks: “Foreigners only know that the Great Wall is the seventh wonder of the world, actually, modern Chinese construction is even more amazing.” And it cited the train, termed the ‘pride of the Chinese people’. Ten years ago, Beijing hoped to solve several issues with the arrival of the train on the plateau. It has partially succeeded. The railway indeed triggered a frenzy of infrastructure development on the plateau; the instability of the restive region has apparently been contained; a mega economic boom has been brought by tourism and as importantly, the border with India is mightily reinforced. Once could add that the exploitation of the natural resources of the plateau (like water and minerals) has reached new heights. The main pretext for rapidly developing the infrastructure has been tourism. In 2015, the Tibet Autonomous Region (TAR) broke all records; it welcomed more than 20 million tourists. The tourism industry in the TAR generated 4.26 billion U.S. dollars, nearly three times the figure of 2010. For Beijing, the tourist boom is a win-win solution to solve all the problems of the plateau; the Chinese authorities have hence decided to accelerate the infrastructure construction and develop high-end tourism brands with a new railway line from Chengdu (Sichuan) to Lhasa. The Western leg from Lhasa to Nyingchi to be completed by 2020, will reach the Indian border. Then, a railway line to Kyirong and Nepal, probably to be continued to Kathmandu and perhaps Lumbini; a second international airport in Lhasa, a new airport in Nagchu, a 4-lane highway between Lhasa and Nyingchi (the Arunachal border) and finally the improvement of National Highway 219 between Tibet and Xinjiang, cutting across the Indian territory in the Aksai Chin area of Ladakh. On April 25, 2016, Xinhua reported that the National People's Congress (NPC) discussed a new law on national defense transport. The legislation will cover the use of infrastructure for defense as well as civilian purposes. Kashmir is once again on the boil. It would be wrong to simplify the issue and put the entire blame on Pakistan. Other issues such as allowing public funerals when the Jammu & Kashmir Government is aware that thousands of Kashmiri residents would defy the curfew, have certainly added foment. While expressing deep shock over the killing of Wani, Sharif spoke of “the people of Jammu & Kashmir demanding their right to self determination.” Sartaj Aziz, the Prime Minister’s Advisor on Foreign Affairs, went (as usual) a step further than his boss. Talking to Dunya News, Aziz stated “such acts are violation of fundamental human rights of Kashmiris … (who) only demand freedom and liberty whereas India is continuously spreading chaos in the region.” As a good durbari, he pledged to raise his country’s voice “against Indian brutality in Kashmir at international forum.” Nothing is new under the Pakistani sun. A few days before the Srinagar incidents, I was putting some order in my old papers and came across some decades-old documents which I had found in the archives of the Ministry of Foreign Affairs of France when I was researching for a book on Kashmir several years ago. Amongst other documents, a cable sent on January 8, 1959, by Bernard Dufournier, the Ambassador of France in Pakistan, makes fascinating reading…57 years later. It first refers to a communication “sent on October 24 (1958) by Lall and December 18 by Prince Aly Khan to the Security Council (which) have shown that the case of Kashmir remained a source of conflict,” says the Ambassador. Islamabad can continue to dream, after all Pakistan is built on a dream; in the meantime, Delhi should keep a closer tab on the so-called Indian intellectuals, not only preachers like Zakir Naik, who propagate the ‘dream’ of a self-determined Kashmir. They are far too many on the social networks. Three years ago, in a post ‘Chinese Hans from Tibet', I mentioned that three senior Han officials had been nominated in the Tibetan delegation to the National People’s Congress . One was Wang Huning, the powerful member of the Politburo and close confidant of President Xi Jinping. He was probably put in this position to report to his mentor the ‘feelings’ of other Tibetan delegates. The second Han in the delegation is Dr. Ding Zhongli, a well-known environmentalist, whose job seems to keep a tab on the plateau’s environment. The third one was Chang Xiaobing, former Chairman of state-owned China Unicom for 14 years before taking over China Telecom in August 2015. However, he was detained as part of a graft probe in late December 2015. I had mentioned it here 'Tibet delegate to the Congress investigated'. 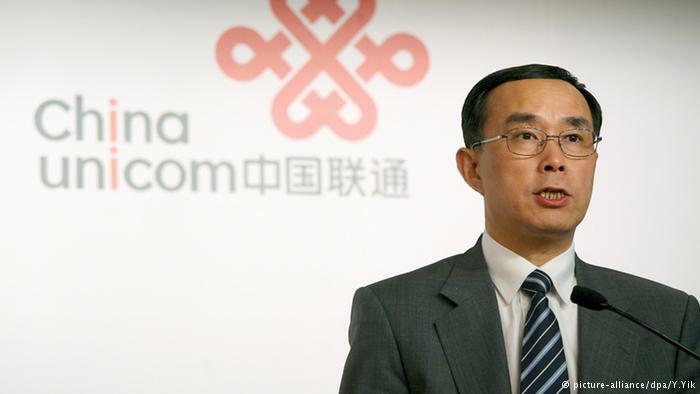 Now Chang Xiaobing faces prosecution, as the Communist Party wrap up an internal anti-graft investigation against him. He has been expelled from the party and sacked from all public offices and the prosecutors have taken over his case. According to a letter by a mainland credit assessment company, Chang would have sold a state-owned office building in Beijing at 800 million yuan below the market price to benefit the family of the disgraced former Central Military Commission vice-chairman Guo Boxiong. Once again, a corruption case points the finger at the People’s Liberation Army and its two infamous vice-chairmen, General Guo Boxiong and General Xu Caihou. Who will replace Chang in the Tibet delegation is not known. One of the most important strategic developments in the recent decades has been the arrival of the train on the Tibetan plateau in July 2006. Ten years later, the event has been largely ignored by the Indian media. The train has not brought radical changes for the Tibetans alone, but for India’s defence preparedness too. An article on the China Tibet Online remarks: “Foreigners only know that the Great Wall is the seventh wonder of the world, actually, modern Chinese construction is even more amazing. 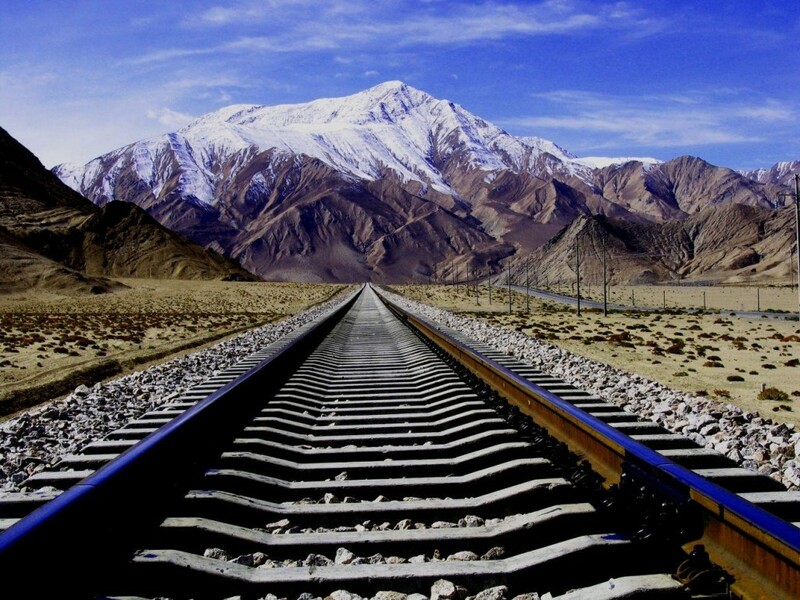 …For example, there are the 130 thousand railroad workers working in the ‘forbidden zone of life’ on the Qinghai-Tibet plateau, with no past references, they have solved many technical problems such as building a railway through frozen soil, and achieved a miracle in human railway construction, the Qinghai-Tibet Railway (QTR).” The train is termed the ‘pride of the Chinese people’. Ten years ago, Beijing hoped to solve several issues with the arrival of the train on the plateau. It partially succeeded. Once could add, that the exploitation of the natural resources of the plateau (like water and minerals) has reached new heights. The main pretext for rapidly developing infrastructure has been tourism. According to the Ministry of Environmental Protection, Lhasa is one of the cities with the best air quality in China. The ministry compiled air quality data from 74 major cities. Seven of them, including Lhasa, have met the national standards for best air quality for five main pollutants. Further, tourism brings tremendous revenues to the regional government and helps in tackling the two other issues, the ‘stability of the plateau and the defence of China’s borders. Lhasa, Tibet’s capital alone saw its tourism revenue triple over the past five years to an estimated 2.51 billion dollars. The number of tourists visiting the capital rose to 11.79 million in 2015, a 23 percent increase compared to 2014. Indeed several extensions of the railway line are coming up. In the wake of the 2008 unrest in Tibet, Beijing still seemed nervous. On September 7, 2015, soon after a grandiose parade on the occasion of the 50th Anniversary of the Tibetan Autonomous Region, Yu Zhengsheng, a member of the Standing Committee of the Politburo, who was the chief guest, met a large number of representatives from the PLA and the People’s Armed Police Force (PAPF) posted in Tibet. It is worth noting that according to the TAR’s Tourist Bureau there were more than 100,000 Tibetans engaged in tourist services in Tibet in 2015. By providing a decent income to the local Tibetans, China believes it can keep the restive populations relatively happy, thereby ‘stabilizing’ the plateau. Soon after the PLA entered Lhasa in September 1951, the Chinese started improving the infrastructure between China and Tibet and building new strategic roads on a war-footing. Mao Zedong knew that the only way to consolidate and ‘unify’ China’s new colonies (Tibet and Xinjiang) was to construct a large network of roads. 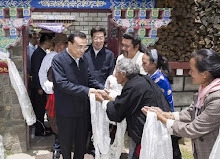 Priority was given to motorable roads: the Sichuan-Tibet and the Qinghai-Tibet Highways. Surveying for the Tibet-Xinjiang Highway cutting across Western Tibet (and the Indian territory in Ladakh) started at the end of 1951; construction began in 1953/54. On 29 November 1954, Xinhua News Agency reported: “The two large armies of road builders from the eastern and western section of the Sichuan-Tibet Highway joined hands on November 27.” A month later, the Qinghai-Tibet Highway was completed. Both the road network and the airports were to play a crucial role not only in what China calls the ‘Liberation of Tibet’, but also in the 1962 border conflict with India. The allusion was not lost on anybody. In 1959, while intervening in Parliament on the 'Aksai Chin road', Prime Minister Jawaharlal justified why his government had taken more than two years to discover that the PLA had been building a road on the barren heights of the Aksai Chin plateau in Ladakh, by saying: “Nobody has been present there. It is a territory where not even a blade of grass grows.” It had just come to light that a Chinese road had been built through Indian territory. An antiquated ‘Inner Line Permit’ dating from the Raj still prevails in many border areas. It was recently announced that this may change soon, but one has to see it to believe it. As the Dalai Lama, the apostle of peace, celebrates his 81st birthday in Karnataka, China is reinforcing its war preparation on the Tibetan plateau. It does not mean that a conflict is imminent, but in case China has 'to face India', Beijing wants to be ready. A year ago, I mentioned on this blog the dual-use of airports in China. 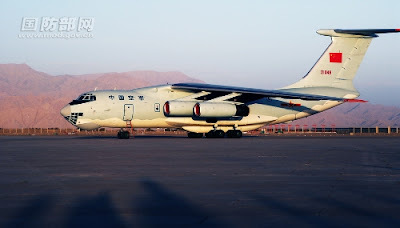 Xinhua had just announced the possible integration of civil-military airports to "strengthen aviation safety and combat support capabilities." 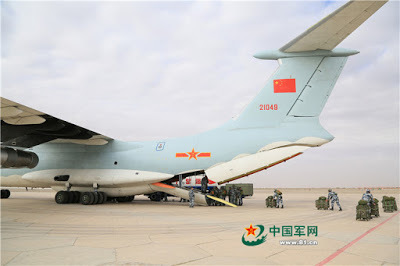 A joint statement from the People Liberation Army Air Force (PLAAF) and General Administration of Civil Aviation (CAAC) had announced that the integration will include joint maintenance of airport support facilities, joint flight safety support and joint airport management. Interestingly the Lhasa Gongkar Airport in Tibet was one of two first pilot airports to implement the 'integration'. The other one was the Sunan Shuofang International Airport in Wuxi in Jiangsu province. A joint meeting on the development of military-civilian integration of dual-use airports of the PLAAF was held in Beijing on June 17. 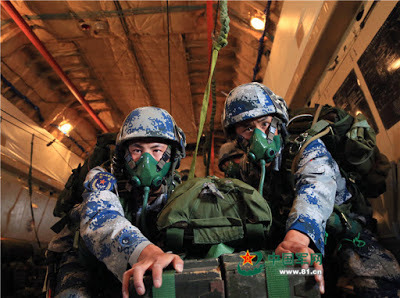 On the agenda was the "Interim Provisions of Operation Security at Dual-use Airports of the PLA Air Force." 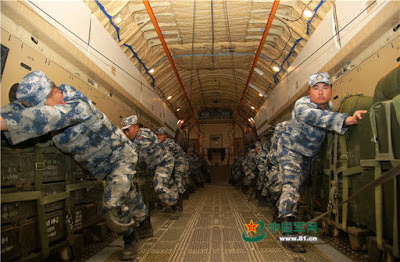 The PLA website said that it is based on win-win principles for both the military and civilian sides. Lhasa Airport has always been the hub to ‘defend' China’s borders …against India. 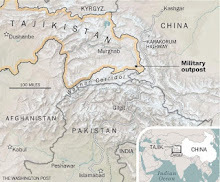 Tibet is one of China's largest regions but with only three line brigades protecting it (52nd, 53rd and 54th mountain Brigades), clearly it's ORBAT [order of battle] is not geared for large scale military operations, especially in defense against a foreign power's [i.e. India] new mountain strike corps. 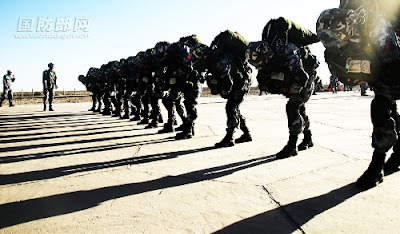 To beef up, the PLA high command is shifting its 15th Airborne Corps for rapid reinforcement from Wuhan in time of crisis, hopeful this buy time until REGFORCE [regular forces] reinforcements arrive. 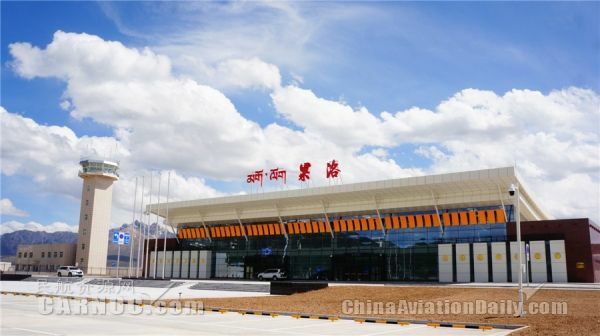 Does it means that the up-gradation of the Lhasa Airport goes on the civilian budget? Probably! All this is not really new, but it has now been formalized and the new arrangements come under a law. In the future it will be officially extended to all infrastructure development, including roads, railway lines, etc.. When will the Tibetan plateau become a Zone of Ahimsa as the Dalai Lama once wished. Not soon! Incidentally, on July 1, the 1st Airbus A330 'wide-body' jet of Tibet Airlines 'smoothly' landed at Lhasa airport. "It marked that Tibet airlines formally entering the era of 'wide-body jet', reported Xinhua which added: "The maximum take-off weight of the Airbus A330 wide-body jet is 242 tons, which is the first of its kind in China. What's more, it is also the first kind of wide-body jet that possesses advanced navigation ability in the world. The wide-body jet has many advantages on seats, cruding range, and plateau operation, which is conductive to the development of Tibet airlines and has landmark significant meanings." It can certainly be dual-used in times of 'difficulties'. Another piece of news: the China Eastern Airlines Flight A319 smoothly landed in the Qinghai Golok Airport at 2:20 p.m. on July 1. It marked the formal opening of the Golok Airport, according to chinanews.com. The Golok Airport is located 5.5 kilometers southeast of Dawu Township, Maqen County of Golok Tibetan Autonomous Prefecture. Some 170 million US dollars were invested into the 3,788-meter-high runway and airport facilities. It is the 6th highest airport in China and the 8th highest in the world. The airport was designed for a future capacity transporting about 80,000 passengers by 2020, carrying over 200 tons of cargo and accommodating 940 planes landing and taking off. The construction project started from August 29, 2013. The use of this airport will be two-fold: "push forward the economic development powerfully and speed up construction of the Sanjiangyuan National Park" and bring reinforcement of troops of the People's Armed Police Force in case of need. Golok in the most restive county in Tibet. 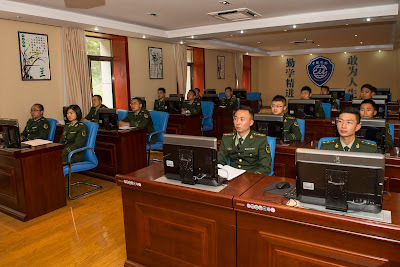 A Chinese website has announced that in order to provide better service, the Yatung's border station, near the Sikkim border "has set up a cultural exchange platform for its police officers, using cultural exchange lectures, classroom instruction, discussions, and other methods to enhance the operational capacity of the officers on duty, increase officers' foreign language level, and create a good living environment for the police officers." PLA officers are learning Hindi! We are all followers of the same Buddha? 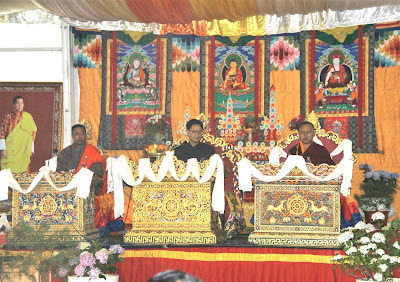 We are also informed that Rijiju addressed the Closing Session of International Conference on “Vajrayana Buddhism: A Mandala of 21st Century Perspectives” at the Royal Institute for Tourism & Hospitality (RITH) in Thimphu. A few words about this three-day conference on Vajrayana. Last year, I wrote on this blog a piece titled, Buddhist Union – Spiritual Confluence or Geo-Politics? In another piece, I mentioned: "Prime Minister Modi has been promoting a new term, ‘spiritual neighbourhood’. He used it during his trips to Sri Lanka and more recently to Mongolia to link up with Buddhism. It makes for good diplomacy." On March 19, 2015 the Dalai Lama had met with a delegation of Sri Lankan Theros (senior monks), to discuss about Vinaya, the Buddhist monastic discipline. It was a rather rare occurrence, as the followers of the Buddha rarely ‘exchange’ their views on their respective interpretations of the Buddha’s words. 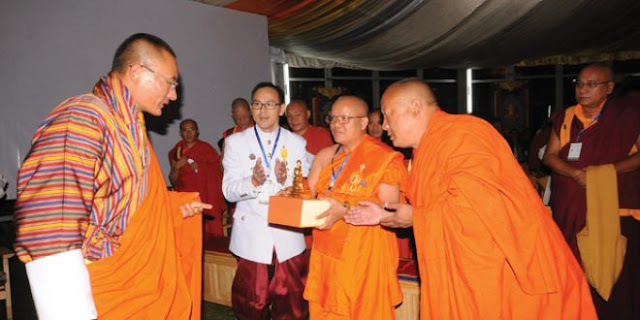 Though Vajrayana is often associated to ‘Tibetan Buddhism’, no Tibetan invited in Bhutan. The answer can probably be found in the historical antagonism between Tibet and Bhutan, but also (and linked to it), in the sectarian clashes between the Drukpa and Gelukpa schools of Buddhism. 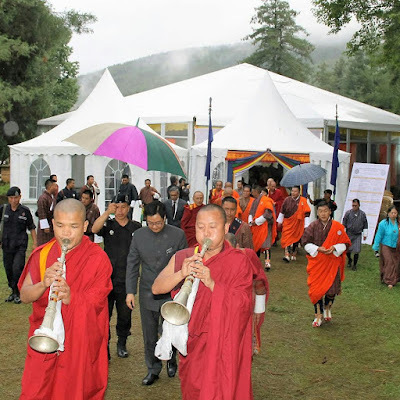 The conference was organized by the Central Monastic Body and the Centre for Bhutan Studies & GNH Research (with inputs from Ian Baker, a Buddhist scholar and board member of the International Society for Bhutan Studies, says the official announcement). The organizers had announced that the speakers would be world-renowned spiritual leaders as well as prominent scholars and neuroscientists researching the effects of yogic and contemplative practices on the human brain and wellbeing. It sounds similar to the decade-old ‘Mind and Body’ programs of the Dalai Lama. For Bhutan, it is certainly a unique opportunity to push its ‘Happiness’ USP and promote its cultural and heritage. The Royal Government should be complimented for this. For Dharamsala, the time has perhaps come to start an ‘intra-faith dialogue’, it is as important (if not more) as the present ‘inter-faith dialogue’ for the survival of the Tibetan identity. A lot could be said on this. I leave it for some future posts. Very few events have triggered such a flood of comments as the vote for the Brexit in UK. For some, it was suddenly as if the world had ended; though it may not be, it could be the last journey of an empire on which the sun used to never set. 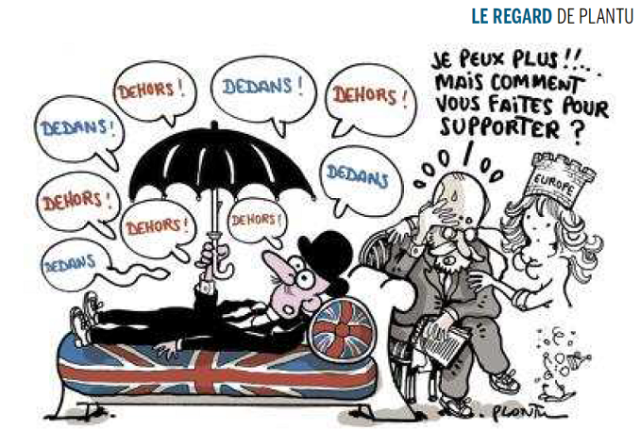 Cartoonists have also tried to capture the folly of the Brexit. One of the most telling caricatures I came across was by Plantu in Le Monde. It symbolizes the decade-old love-hate of the British for the European Union. As both Germany and France had to rebuild their industries, a supranational High Authority would be created to manage the resources in coal and steel for both nations. Monnet convinced Robert Schumann, the French Foreign Minister and the German Chancellor, Konrad Adenauer and hence the embryo of Europe was born. A treaty was signed in Paris in 1951 establishing the European Coal and Steel Community. A close partnership between the enemies of yesterday was set in motion, though (or because) no ‘ideology’ was involved. Six years later, six European states (France, West Germany, Italy, Belgium, The Netherlands and Luxembourg) decided to focus their energies on integration and union. Europe was born on March 25, 1957, with the Treaty of Rome. The main object of the Treaty signed in the Italian capital, was to set up a customs union and a common market between the member states. When the British put their candidature in 1961, many started questioning their entry into the Common Market. Charles de Gaulle was one of them. Two years later, during a press conference, after mentioning that London had refused to participate in the first experience, the general explained that the character of the British nation was “insular, turned towards the sea” and the nation had always been linked “through exchanges, markets, supplies to far-away countries”, not with Europe. He added that the “nature, structure, situation of England are deeply different from the ones of the continental people”. De Gaulle had a point. Eventually, Great Britain was admitted in the Union in 1973, but doubts persisted in London, as the cartoon shows. Coinciding with the Brexit, a second major event made the headlines during the last couple of weeks: the Euro2016 Football Cup. While politicians and ‘experts’ discussed the implications of UK leaving the EU, lakhs of enthusiasts supporting one of the 24 ‘national’ teams poured into the main cities of France. One could suddenly see the true diversity of Europe. From the organized Russian ‘breakers’ who destroyed the centre of Marseille on the first day, to the British hooligans, the Albanians, the Polish, the Scots or the sweet ‘green army’ of Ireland, who got the Golden Medal from the City of Paris for their exemplary behavior; all were Europeans. Euro2016 was indeed a showcase of Europe in its diversity. But to build a political Union on this diversity is not an easy proposal. Today’s Europe is not perfect, far from it. The babudom of Brussels has taken colossal size and power, but globalization cannot be wished away, hence the need for unity. Take the case of Iceland, a small island with a population of just 319,756 people. The ‘Vikings’ managed to send England packing in the Euro pre-quarter final. Iceland has suffered more than anybody else when the global financial crisis hit the island nation in 2008. Its currency crashed, unemployment soared and the stock market was wiped out. Unlike other European economies, the Reykjavik government let its three major banks fail and went after the bankers; even Prime Minister Geir Haarde was put on trial. It may work, who knows? The events of the last weeks demonstrate the difficulty to ‘unite’ while keeping the identity of each participant alive, but Europe is a ‘process’, not the end; it is where the British got it wrong.